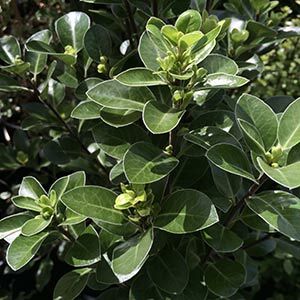 A Pittosporum that grows well in coastal conditions is Pittosporum Ralphii ‘Stephens Island’. Also known as the Stephens Island Karo. The foliage has a good texture to it, when new it is a lime green, toning to a deeper silvery olive green with time. Foliage has a white tormentum on the reverse. This is an interesting plant when grown as a shrub, however it lends itself to be standardised and trained as a topiary or small tree. Also well suited for planting as a semi formal hedge. Growth habit is naturally neat and it is reasonably fast growing. Over 6 years you could expect Pittosporum Ralphii Stephens Island to have a growth rate of .5m a year. As a hedging plant the dense foliage makes it excellent for blocking out neighbours. Also useful in the border as a background plant where the deep silvery green foliage acts as a good contrast to other plants. Suited to coastal gardens and useful as a low growing windbreak. Also suited for some forms of topiary, especially larger balls and pyramids. The root system is non invasive although it does prefer a cool root run. We suggest mulching around the plants for best results. Sunny position to light afternoon shade. Well drained humus rich soil. Grows well in coastal soils. Frost tolerant. Once established reasonably drought tolerant. Height – To 5m plus, usually pruned to 2 – 3m. Foliage – Mid to deep green with undulation. Drought tolerant – Marginally once established. Available for sale at larger nurseries.